Saturday, July 1, 2017, 5:00 p.m. – 6:00 p.m.
Discoveries from the Fleisher Collection starts the Independence Day weekend with that most-independent of American composers, Charles Ives. His music is wild, grand, humorous, poignant, and, at times, ornery. Most of all, though, it is shot through with that very American streak of independence. It isn't a non-musical independence, like a personal or a political statement would be, but goes deep into the grain of music. The independence of Charles Ives is that stubborn willfulness to grab a moment—any moment, no matter how exuberant or plain—and shake it until all artifice drops off and all that's left of the moment is, well, its momentousness. His Second Symphony is a perfect example. 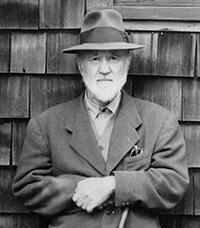 Composed when Ives was in his 20s, it's his breakout symphony. The First is well done, but even with sharp corners here and there, it's a little too schooled, too European. With the Second, you hear "Turkey in the Straw," "Camptown Races," "America the Beautiful," "Long, Long Ago," and "Columbia, the Gem of the Ocean." They rub shoulders with, almost riot with, strains of Beethoven's Fifth, Brahms's First, Bach, and Wagner. And then Ives tosses in hymns, spirituals, reels, and more: enough to expand it into a five-movement symphony. Like many Ives pieces, the Symphony No. 2 wasn't premiered until years after its creation; 50 years, to be exact. Leonard Bernstein conducted the premiere with the New York Philharmonic in 1951. Ives, in ill health for much of his life, listened to the broadcast at home with his wife Harmony, on their cook's radio. He was surprised by how much the audience clapped at the end. Some of Ives's earlier organ music made its way into this work. He was an accomplished organist, playing in churches from age 14, and one such work came to light because the organist E. Power Biggs asked him, in 1949, if he had anything Biggs might play. They uncovered Variations on "America." Biggs then edited, published, and performed it. The composer William Schuman orchestrated it in 1963, and again the New York Philharmonic stepped up for the premiere, in 1964, with André Kostelanetz conducting. It is a mistake to think of these Variations as satire. Ives never satirizes. It's closer to the mark to listen to these as a young boy might, a boy who grew up with fervent bands of amateurs playing music as if their honor—or the honor of their country—depended on it. Ives's father directed such bands. Young Charlie played in them. He is in love with this tune, and that is one secret to the strange pull and influence of Ives on American music. The other thing to remember, and which gives context to these Variations, is that when Ives wrote it, as organist in a Brewster, NY, Methodist church, and played it at the July 4 celebration (after trying it out first in February—can you imagine what the congregation thought of that? ), he wasn't that far removed from the boy at the parade. When Variations on "America" was written down, Charles Ives was 16.